Home // C.O.R.N. Newsletter // 2018-08 // Pattern Favors Only Slow Improvement - Challenging Weather to linger throughout April! Pattern Favors Only Slow Improvement - Challenging Weather to linger throughout April! The expected cold and wet weather pattern for spring that has been forecast since December continues. There will be some relief this week after a cold start to the week with temperatures 10 degrees below normal we will switch and see temperatures by the end of the week a good 10+ degrees above normal but when average out through Sunday April 15, we will return to about average temperatures for the week. Drying is expected as well through Friday with only minor precipitation events but another rain event is expected this weekend. There is a lot of uncertainty on amounts and placement so confidence is low but there is potential for some heavy rain in parts of Ohio. The week of April 16-22 will return to a colder than normal pattern with temperatures several degrees below normal. Precipitation will be lighter next week after the weekend rain event. Though April 25, rainfall is forecast to average 2-3 inches with isolated 4+ inches across the state of Ohio. This is still above average. See the associated graphic from the NWS Ohio River Forecast Center. Soil temperatures will also continue to be below normal with the risk of some late freezes in late April so early planting risk will remain elevated. Improvement will likely not fully come until May when temperatures may actually be slightly above normal. 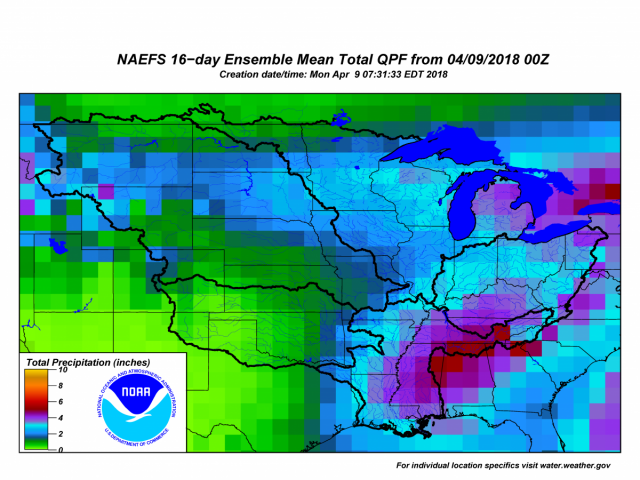 However, rainfall may continue to be at or above normal so challenges will likely linger this year into May for planting season. The summer growing season still looks to see a switch toward warmer and drier weather but it is not clear whether this will happen in later May, June or early July. We will keep you posted. In summary, thanks in part to La Nina, expect a challenging planting season in Ohio into May. Summer may also offer its own challenges as the pattern switches from the cold and wet period to a warmer and drier period but it is uncertain exactly when that will occur.